So I found this pattern online, but I can't remember where, so I apologize for that. He's a simple little birdie that needs some friends. Guess I'll have to make some more! 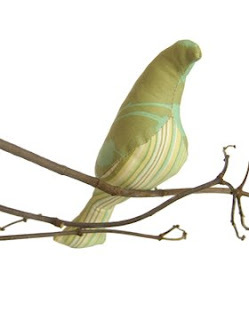 I remembered where I found this birdie pattern. I found it at Spool Sewing. ok, when are you opening you etsy shop already? August 1st! Actually, I'll be on vacation that day, so my stuff will probably show up on the 3rd or 4th. I'll be sure to post a link on my blog!